Treat a variety of bird species to their favorite foods with this Shell Free Fruit and Nut Seed Mix. 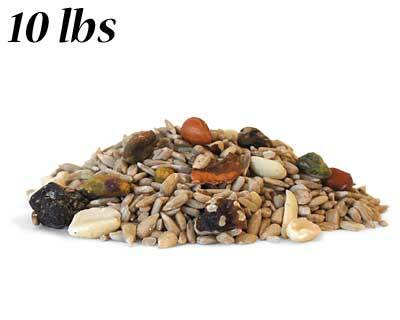 This fantastic mix of seeds, nuts, and dried fruit not only offers your feathered friends plenty of nutrition and energy; its unique blend also invites a bevy of different birds to the area. Tree nuts and peanuts, along with sunflower chips, provide fat and protein the birds need to thrive, while the dried cherries, raisins, and cranberries are great for fruit eating birds. This product is perfect for use in hopper, platform, or tube feeders, and the 10 pound, resealable bag helps feed remain fresh. Keep the birds in your backyard fed using this Shell Free Fruit and Nut Seed Mix. Note: This Shell Free Fruit and Nut Seed Mix is packaged in a convenient, 10 pound bag.